If you’re wondering whether the price of your house is likely to rise anytime soon, you’d do well to check out how your local schools perform in this week’s GCSE results, according to new research from Homeowners Alliance. According to the research, property values in areas with a much-improved school rise faster than the national average. 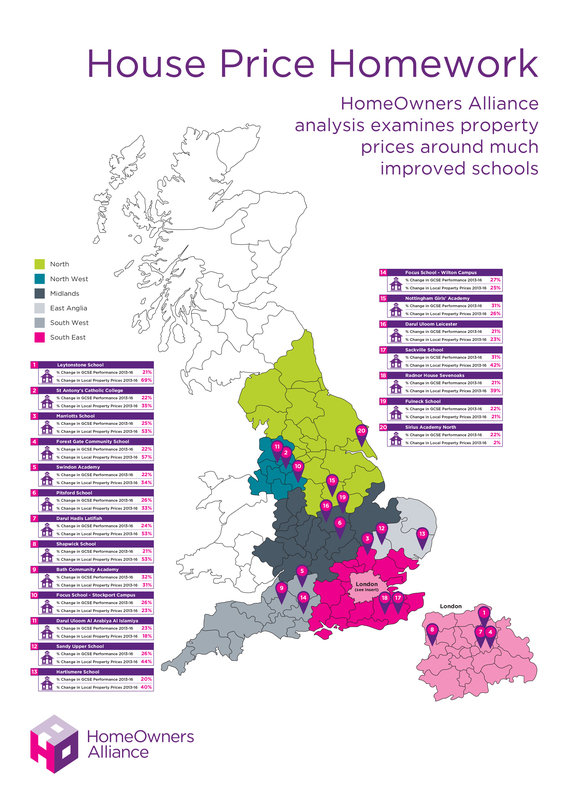 Homeowners Alliance analysed the GCSE results of every school in the country in 2013 and 2016 and house prices over the same period of time and found that properties in local authority areas that are home to one of the top 50 most improved schools went up by an average of 28.1% between August 2013 and December 2016, almost four percentage points more than the national average of 24.75%. The study found the east of London suburbs have the highest concentration of most improved schools. The strongest performer in this category was the Leytonstone School in east London, which saw residential values rise by close to 70%, outperforming the wider London region (44%) by over 25 percentage points. In addition to the Leytonstone School, Darul Hadis Latifah school in Bethnal Green and Forest Gate School both make the top 50. The former has seen local property prices increase by 53%, while the latter has seen prices rise by 57%. This is against a regional benchmark of 44%. 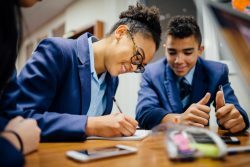 Meanwhile, in the north-west, St Anthony’s Catholic College in Manchester saw local property prices rise by 35%, against wider regional performance of 16%, a difference of nearly 20 percentage points. Similarly, Focus School in Stockport saw prices rise by 23%, a seven-percentage point increase on the regional benchmark. In the south-west, where Swindon Academy and Bath Community Academy both made the list of top 50 most improved schools, property prices in the areas surrounding the schools rose by 33% and 31% respectively, considerably higher than the regional average of 24%. “We know that good schools are a major concern for families and therefore an improving school can really help to increase the demand for housing in the local area. It’s always very difficult to isolate any one factor as the reason for property price growth, but it is telling that across the country, prices have grown more in local authority areas that are close to a much-improved school. Furthermore, this effect is not contained within London, but spread throughout the country. “Although few and far between, moving home is almost always influenced by three factors in life – work, marriage and kids. While we are happy to make sacrifices on a personal basis to find that perfect home, a longer commute for example, when it comes to our children they are often at the very forefront of our property purchase decision process. “Many plan years in advance to ensure they are living in the right catchment area once their child comes of age and this initial foundation can be pivotal to the success of their education. As a result, we’ve seen parents resort to drastic measures such as ghost rentals, just to get their child into a good school. However, with a good school comes a premium property price and so many simply cannot afford to buy where they would like and much like high house prices pushing buyers to the “next best” location in the surrounding area, it can also have the same impact where schools are concerned.